Remove the core of the apple so you can get slices in the shape of a bagel. Slice. Cover both sides of the apple slice in lemon juice to keep it from turning brown. 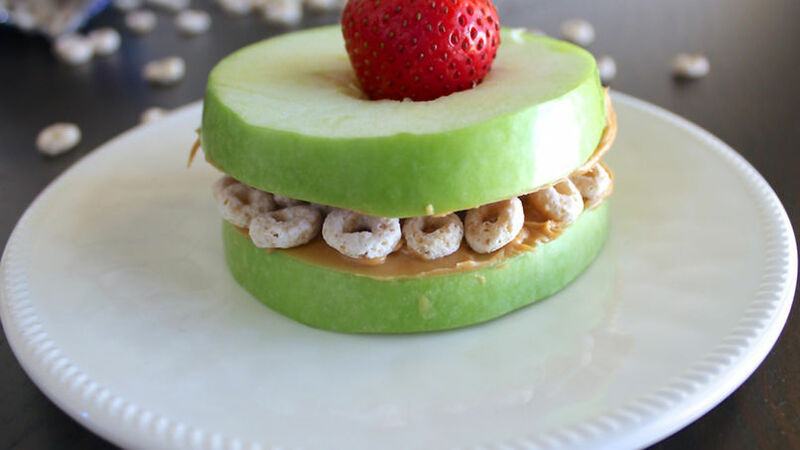 To make the sandwich, create alternating layers of apple, peanut butter and cereal. Finish with another layer of apple. Top with a strawberry and serve. Use honey or agave nectar instead of peanut butter. When I was a little girl, dinnertime was always a problem. There weren’t a lot of foods I liked, so I didn’t look forward to seating at the table because my mom would always expect me to finish everything on my plate. Things changed as I grew: I discovered new flavors that captivated my palate, so much so that I wanted to learn how to make them. Making meals and snacks that kids will enjoy is not an easy task. They are a hard crowd to please! Fortunately, nowadays we have a ton of resources for ideas where we can find recipes to please all ages. Today, I would like to share with you a snack that has been approved by my niece: a delicious apple sandwich with peanut butter and Cheerios™ cereals.